At Montgomery College, a public, open admissions community college in Maryland, 2015 was the year that their campuses earned a well-deserved recognition for sustainable, healthy and green cleaning practices and programs. Congratulations to the 2015 Green Cleaning Award Honorable Mention in Higher Education, Montgomery College! “Our goal with the green cleaning program was to create a dynamic cleaning program focused on protecting the health of our staff, and students while contributing to the environment in a positive manner,” says Rodney Boone, the building services coordinator on the College’s Takoma Park/Silver Spring Campus. The campus’s first step was to pursue GS-42 certification with their training program, with guidance from the Building Wellness Institute and their cleaning and equipment distributor. GS-42 is the Green Seal Standard for Commercial and Institutional Cleaning Services, which establishes environmental requirements for cleaning service providers of commercial, public and institutional buildings, including in-house and external cleaning services, to create a green cleaning program that protects human health and the environment. Schools can learn more on Green Seal’s website. This summer, the campus team began the GS-42 certification process on a new building and is excited to continue this process across the entire campus. 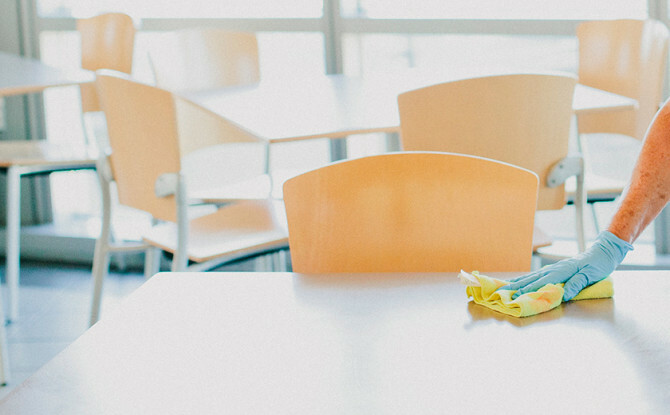 We often talk about the importance of green cleaning for student health, but we don’t often focus on the huge benefit a green cleaning program can have on cleaning staff, too. For Montgomery College, those results have been astonishing. “Since we started our green cleaning program, we have not had one staff member call out sick,” says Boone. In addition, there have been no complaints about the health effects of cleaning chemicals, sometimes a common occurrence in the cleaning profession. Boone is also proud to report that there have been no safety accidents within the last three years in the entire cleaning department. First, Montgomery College seriously cut its list of products. The team scaled down from a list of 20 separate cleaning products to only five products to keep the entire campus clean. The campus also installed dispenser systems directly in its supply closets, and its distributor delivers the products right to its closets. Not only does this cut down on the campus carbon footprint, but it’s also great for the bottom line. “That saves us money on packaging, frees up our warehouse space and allows us to use it for other things,” says Boone. Not only is staff healthier and happier, but their time is used more wisely, too. The new dispenser system frees up staff time because cleaning personnel is no longer transporting products. “Our team can focus on cleaning with all their time now,” says Boone. Montgomery College also upgraded its equipment to green certified technology including some on-site generation equipment, HEPA-certified backpack vacuums and a window washing kit that washes all windows with only water pressure (no chemicals). The cleaning department worked with the student life department among other groups, including campus religious groups, who volunteered to help with cleaning. “We get a lot of feedback especially from faculty members because we’re saving the environment and we’re going the right way in cleaning for health,” says Boone. This campus is engaging more than its students and school community, it’s also touching members of its entire community and county. Montgomery County holds a Green Fest every year, and in 2015 the college’s Takoma Park/Silver Spring Campus hosted the event. “We also are not just housekeepers; we are environmental specialists helping the community,” says Boone. This college is doing amazing things for the health of its campus and staff, making cutting-edge, innovative and important green cleaning choices. It’s also showing inspiring ability to engage a large variety of stakeholders in its mission. This is what we love to hear about when we meet new schools and universities. Thanks again, Montgomery College! Is your school interested in being recognized for excellence in green cleaning? Be the first to find out when the 2017 award application is released!